Here's a little bit about me. I have been crafting since 2003. Although I mostly make scrapbook layouts, I LOVE to play around with mixed media and textures and incorporating all of it onto my layouts. 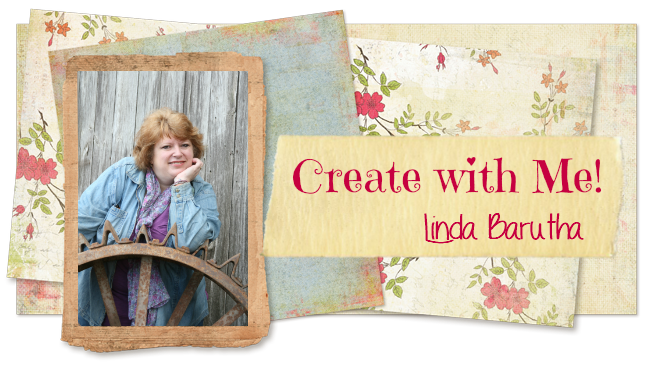 I was on the very first design team here at Linnie Blooms. I stayed around a while and then as life happens, I got extremely busy and had to cut back on a few design teams. But you couldn't keep me away from playing with CANVAS for long! :) I am back and super excited to hopefully inspire you all with my creativity! To create the background, I started by treating the canvas with Gesso. Then I used Gelatos with water to create the background color. Next, I took a honeycomb stencil and used a babywipe to remove the gelato color exposing the white Gesso. I used the same technique with a Bingo stamp creating a white bingo image. After sprinkling a few drops of Studio Calico mist sprays and letting the piece dry, I added the doily and covered it with a very thin coat of clear Gesso. To finish up the background I used Linnie Blooms stitch stamps - Stitched Greetings and Stiched Sunshine -- LOVE THEM!!! I pretty much did the same with the pennants. I used Gelatoes and stamps. Lastly, I layered the papers, bird, rosette ribbon, pennants and bling pulling it all together by adding an adorable photo of my Best Friend’s granddaughter! There you have it! I hope you like my project and I hope it inspires you to play around with these awesome Canvas Pieces. You can find more information about these Canvas Pieces on the Linnie Blooms website. OMG!! WOW!! OMG!! Your canvas is Gorgeous!! Love the picture and you so showcased your cutie patootie angel in one grand artistic way!! You definitely did one super outstanding creative job!! It is breathtaking. I feel so honored to have seen it. thanks so much for sharing. YOU ROCK! Very pretty canvas! Awesome work!